Here's delightful news about a nearly all-volunteer non-profit that works quite effectively (and joyously!) to eliminate fake food dependence so common at organizations serving the hungry, including pantries, kitchens, shelters, and food banks. Food Forward, a Los Angeles-based effort, was started in 2009 by local photographer, writer Rick Nahmias because he grew "tired of seeing wasted fruit from my neighbors trees littering the yards and sidewalks of my neighborhood, and frustrated with the knowledge that in the last year alone food pantries across the nation have seen an over forty-percent up tick." After a pick, each harvesting between 300-600 pounds of fruit in just a few hours, we drop the fruit at our main receiving partner: SOVA Food Pantry, a non-sectarian project of Los Angeles Jewish Family Services based in Van Nuys which services upwards of 7,700 clients a month at its three LA area locations. In a short three months, we've harvested over 10,000 lbs of fruit - all of it going to the hungry in our city." Food Forward's mission is "to simultaneously alleviate urban hunger while fostering community interaction at a local level. 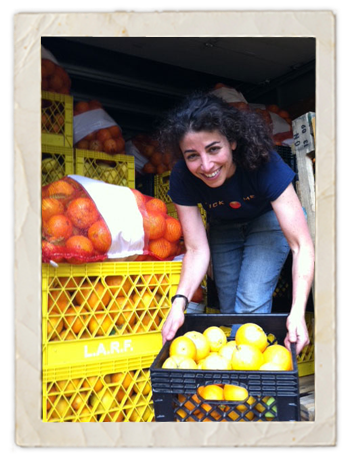 In a nutshell,... a growing corps of Angelenos venture out weekly to glean people's excess fruit and donate 100% of it to local food pantries." The ebullient group regards itself as an emissary of "Fruitanthropy: the picking, donating, or distributing of fruit for humanitarian purposes." Organizations that serve the hungry usually stock only non-perishable canned and boxed goods, mostly donated industrial food products. Fresh, perishable fruits and vegetables, which are rarely donated to pantries, kitchen, and food banks, must be quickly distributed before spoilage sets in. Amazingly, Food Forward has gleaned and distributed, free of charge, 1,275,756 pounds of fresh, real foods in merely four years. 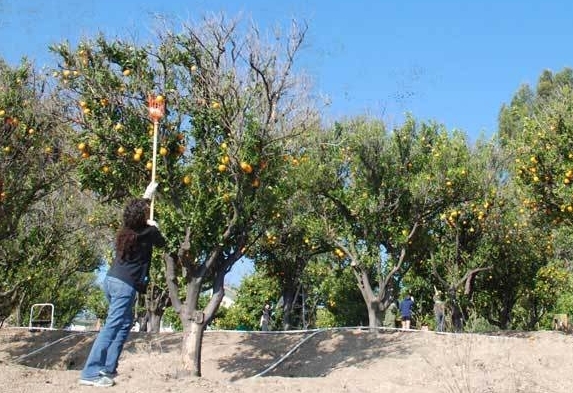 And every last orange, avocado, grapefruit, and all other food was proffered free for the picking by the property owners. One man, one new idea, and the energy to make happen what now feels like a life-saving miracle to the 48 shelters, pantries, kitchens, food banks, and agencies that regularly receive fruits and vegetables from Food Forward. CLICK HERE for a list of receiving programs and agencies. Many of them are quite well-known. All them of them are deeply grateful for Food Forward. 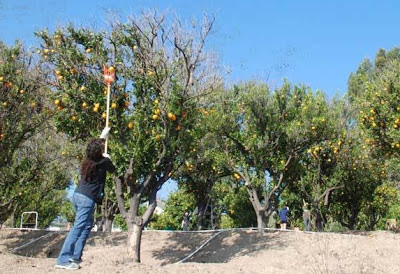 Similar urban fruit gleaning programs have sprung up in sunnier regions of North America, including San Francisco, Las Vegas, and Portland, Oregon. In Tucson, Arizona, Barbara Eiswerth founded Iskashitaa, a remarkable fruit-gleaning program that distributes freshly picked, real foods to refugees in the local community. Per its website, Iskashitaa serves refugees from Afghanistan, Bhutan, Burma,Burundi, Central African Republic, Cuba, Democratic Republic of Congo, The Republic of Congo, Equatorial Guinea, Eritrea, Ethiopia, Iran, Iraq, Liberia, Russia, Rwanda, Somalia, and Sudan. "She started the project four years ago after returning from a stint in Malawi doing graduate fieldwork. Struck by North American over-consumption, Eiswerth hired local youth to map local food resources in four Tucson neighborhoods. When a colleague suggested she involve refugees – there are about 8,000-10,000 in Tucson – Eiswerth saw an opportunity to use gleaning as a way to bridge diverse cultures. 'Food is a wonderful way to welcome them into the country.'" Volunteer-powered grassroots groups, such as Food Forward, who deeply care about real foods, and about making a dent in our country's shameful hunger problem, may be the only viable way for us to combat the insidious prevalence and impact of industrial-corporation food products on our Western diet, particularly for the poor and working poor. And that, indeed, is smile-worthy news in the battle against the fraud and bad-health folly of U.S. industrial foods.